A few years back, when I started diving again, i usually dived in a rash guard and a pair of bermudas in the nearby waters. As time passes, I realized I am wearing more and more although I’m diving in the same waters. Haha. And the interesting thing is.. I actually do feel cold in the water and thinking back, I wondered how I dived in rash guard and shorts only. Dunno if it’s coz I’m getting old or that my body is getting weak. Anyway, I decided to get my first wet suit about 2 years back, not because I feel cold underwater, rather it was because I got scratches and bites on myself every time I came back from a dive trip. I think it was one of the most wise decisions I’ve made. Hahah. I had a 1.5mm Aqua lung wet suit that I got online at only US$39.90! Now that my legs and arms are covered, I realized I started getting bites on my neck! That gave me a reason to spend money again.. Heheh.. At 2013 Adex, I invested in a fourth element hood (with fleece-like inner lining) after much consideration. The hood cost more than my wet suit loh. But it was one of my bestest buys. It is soft on the inside… Warm… Ears covered.. 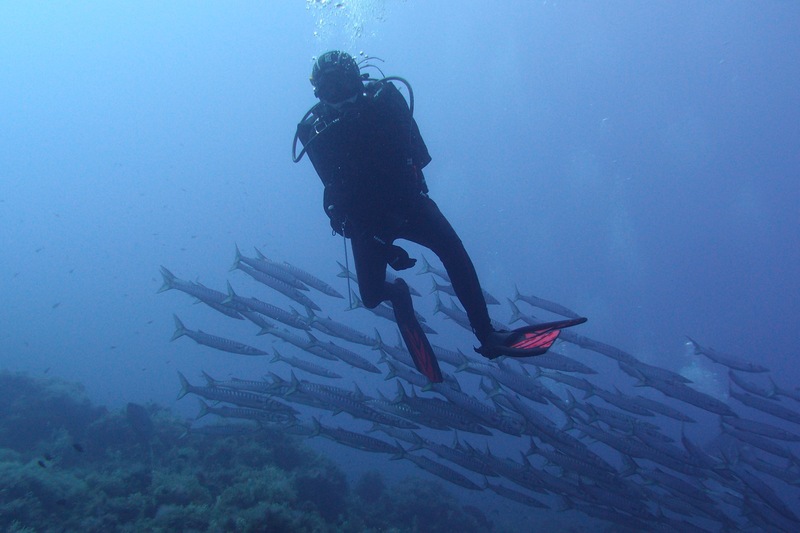 Neck covered… Diving has never been more comfortable. Thermocline also became less daunting!! (Er.. Not that I like to be caught in one). Best part of it all…… I’m so so so well protected from head to toes.. No more scratches or bites.. No more worries about fighting with biting clown fishes hiding in anemones. Oh.. I forgot to mention I also bought a pair of gloves. Hahahahaha. So.. Now that I’ve everything taken care of from head to toes…. I decided I should try to look slimmer underwater (since we learnt that things are supposed to look larger underwater!!) hahaha. Ha.. So I reckoned if I can get a wet suit that is thinner or look thinner and can serve the purpose of the wet suit, I should do that. And I stumbled upon the Sharkskin wetsuit!! As usual, when I want something.. I will keep saying and telling people around me. And………. My dive buddy very generously bought me a Sharkskin wetsuit for my birthday this year. Heheheheh. Oh my god.. The suit is really light! Perfect for traveling. Dries easily too.. Coz the inside is also some kind of fleece-like material.. Quick to dry. After each dive, I just need to hang it up, and before the next dive, at least the inside is pretty dry. Because it looks so thin, lotsa people ask me if it is warm. to be frank, I dunno!!! Whatever wet suit I wear.. I always have my hood vest beneath. I don’t feel cold, but I don’t know if it’s coz of the vest or the wet suit. Hahahahahha. Oh.. So I was saying to look slimmer.. And I think I do look slimmer.. Don’t you think? Wanted to find a pic in my old dive suit.. But couldn’t find any..